Today’s technologies from remote monitoring to video visits hold enormous promise for improving the health and well-being of countless lives. But what about the patient-physician relationship? 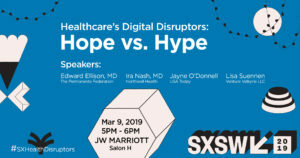 At this spring’s SXSW, The Permanente Federation presents a panel that explores bridging the digital divide to improve the quality of health care, lower costs and make health care more human. Edward Ellison, MD, co-CEO, The Permanente Federation; executive medical director and chairman of the board, Southern California Permanente Medical Group; and chairman and CEO, The Southeast Permanente Medical Group. Ira Nash, MD, senior vice president, Northwell Health; executive director, Northwell Health Physician Partners; professor of Cardiology, Donald & Barbara Zucker School of Medicine at Hofstra/Northwell. Lisa Suennen, managing partner, Venture Valkyrie, LLC. Jayne O’Donnell (moderator), healthcare policy reporter, USA Today.